Sort of spin-off from the "Croatian Tales" project - we decided to make Croatian translations of "Interactive Classics" CD-ROMs, produced by Music Games International and Studio Mobile - guys who made "Yagor" for the "Croatian Tales". 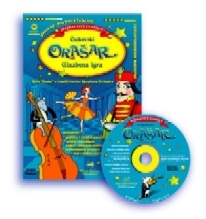 We published three CD-ROMs: "Nutcracker the Music Game" ("Orašar" in Croatian), "Alice in Vivaldi's Four Seasons" ("Alisa i Vivaldijeva Četiri godišnja doba"), and "Mozart's Magic Flute" ("Mozartova čarobna frula"). The games are beautiful, sweet and fun, they got great reviews and won many awards! And most important of all - kids simply love them. "Alice in Vivaldi's Four Seasons"